To make the Tartare Sauce, combine all tartare sauce ingredients with a pinch of salt and a pinch of pepper. Can be used immediately or can be stored in a sealed jar in the refrigerator. To make the beer batter, sift the flour and cornflour into a bowl, and season with some salt and pepper. Make a well in the centre and add the lager and water, then gradually whisk into the flour mixture until you have achieved a smooth batter. The batter should be transferred to a refrigerator for a minimum of 30 minutes, longer if possible before use. Dust the fish portions in a light coating of flour and then dredge in the batter, shaking off any excess. Deep-fry for about 5 minutes in a preheated deep fryer until cooked through and golden brown.You may have to do this in batches depending on the size of your fryer. If you are cooking larger pieces of fish start cooking it in the fryer and then transfer to the oven to finish cooking. Dry off chips thoroughly before frying. Deep fry in hot oil 180°C until fully cooked. 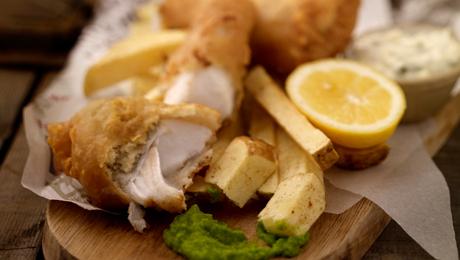 Serve the fish and chips in little newspaper cones , and a wedge of lemon and some tartare sauce - enjoy.